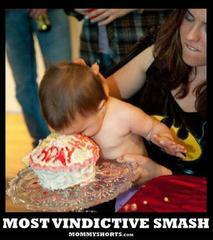 One which I really hate is the fashion for a “cake smash” at a very young child’s birthday party. A real cake, large and beautiful, is put on the floor, and the birthday child literally smashes it with their hands until it it completely demolished, inedible and they are covered in it. The child would have to be encouraged by adults and the whole thing is probably filmed as an amusing video on Facebook or YouTube. Even worse, I have seen adverts for cake smash clothing. Words fail me. Wrong on every level. I agree, what a waste! I haven’t heard of this at all thank goodness and with dgc of 4 and 8 there are at least 2 birthday parties a month. How absolutely dreadful - do you think it might be specific to your part of the country or am I living in a bubble? Never heard of it, but it sounds appalling. How many wrong values does that teach? I have seen adverts for photographers who will provide this service for your baby's first birthday, not something I would want to encourage a child to do. You can put all the pics on Facebook once your little man/princess has smashed their cake. I haven't heard of this either. What exactly does that teach our children and what does it say about the parents who allow it. Not happening with any little man/princess in my family MissA I hate that too. Good grief, we have people going to food banks and others encouraging their young to smash up a birthday cake, thinking it is funny. Would be better if they taught their young that some can't afford such luxuries and took them to the food bank to donate it. It's not specific to a region. I've read it in magazines and seen FB pics. I agree a total waste of good food and a bad example. Never heard of this, thank goodness! How awful, I have never heard of this thank goodness . My GC are past the age of lots of parties now but my AC would certainly feel my wrath if they indulged in such bad behaviour. Have you ever seen anything as horrible as the look on this "Mothers" face. Poor little baby! Often the children are wearing few clothes and sitting on bare floors too. I don't usually get all affronted by things which do not affect me, but this really annoys me. I have seen photos on FB and just cannot grasp what it is all about other than the 2 minutes of fame. To put it bluntly and to quote my grandmother, it is vulgar and common. It's been around for years and it's just a waste of cake in my opinion. I have a lovely picture of one of my DD with birthday cake all over her face and hands - not from cake smashing but from trying to eat a slice all at once (she was only 2, she doesn't even like cake now!). At least my DD had the right idea - birthday cake is meant to be eaten and shared with friends and family. Whatever is wrong with blowing out candles and putting germs all over the cake? I think it's pretty awful, too. What a waste. Again, what a waste. It's environmentally bad and it sends a poor message. If you don't want to keep your dress, then sell it, or donate it to a charity shop. There's even a charity which accepts wedding dresses to use the material to make beautiful gowns for babies who have tragically passed way. Say thank you and discreetly leave the top icing Kittye!